With an unsurpassed reputation for luxury and pampering, there are plenty of places to have a romantic Hong Kong experience. From parks and Peninsulas to trams and treks, the city has plenty to offer starry-eyed couples. Take a look at the suggestions below for ways to romance in Hong Kong. Hong Kong has plenty of seaside spots to stroll hand in hand. While the village of Stanley doesn't have the best beach in Hong Kong, it is less than an hour from the city and makes for a fast romantic getaway. There are two stretches of sand, and in the evening you have every chance of finding yourself enjoying the view alone. The village is also one of the best spots in Hong Kong to eat al-fresco, with dozens of ​restaurants spread out along the promenade and inside the colonial verandas of Murray House. How: To reach Stanley, take bus 6 or 6X from Admiralty MTR station to the end of the line. If you're planning on wining and dining, there is no better spot in the city than the Peak. Once the stomping ground for Hong Kong's colonial elite, today the Peak has been revamped with a host of bars and restaurants that enjoy unbeatable views over the city. Cafe Deco has the most impressive vistas from its wraparound windows, although the Peak Cafe (and its a cottage setting) is the most romantic spot. Be sure to come during the evening to enjoy the blockbuster lights of the most captivating cityscape in the world. How: The best way to reach the Peak is to take the equally romantic Peak Tram from Garden Road in Central. 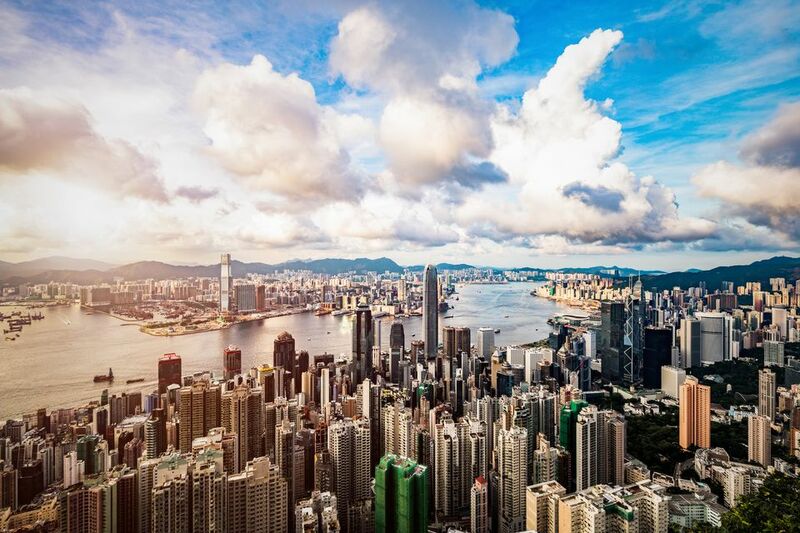 If the view from the Peak isn't spectacular enough for you, surely the ultimate way to enjoy Hong Kong's famed skyline is from beneath the rotors of a helicopter. Heliservices offer helicopters for rent (thankfully including a pilot), as well as packages with the Peninsula hotel, allowing you to combine tour flight of a lifetime with the stay of a lifetime. Still considered one of the world's best hotels, the Peninsula oozes colonial charm and class. Built in the 20's the building is one of the most attractive in Hong Kong. Inside you'll find rooms that have retained their colonial charm, while the first class service is certain to whisk that special someone off their feet. If you can't afford a room, stop by and enjoy high tea. This time-honored tradition from British times is where you can enjoy cakes and tea accompanied by a string quartet. How: The Peninsula is on Salisbury Road, Kowloon, and high tea is at 3 pm each day. Hong Kong is arguably the world's best city for spas, and the city's luxury hotels are in a continual bat-winged struggle to produce the most luxurious spa experience. With so much competition, prices are kept in check, and special offers are available all year round. Most spas also offer dedicated packages for couples. Two of the best far-flung around, although certainly not cheap, are at the Mandarin Oriental Landmark and at the Four Seasons. Set amongst the skyscrapers of Central, Hong Kong Park is the perfect place to uncork the champagne and settle down for a picnic. While the park is somewhat short on actual grass, you'll find plenty of benches that offer views over landscaped lakes, waterfalls, and rivers. The park is also host to the Hong Kong Tea Museum and a decent al-fresco restaurant - useful if you didn't come prepared. How: Hong Kong Park, Cotton Tree Drive. The nearest MTR to the park is Admiralty.